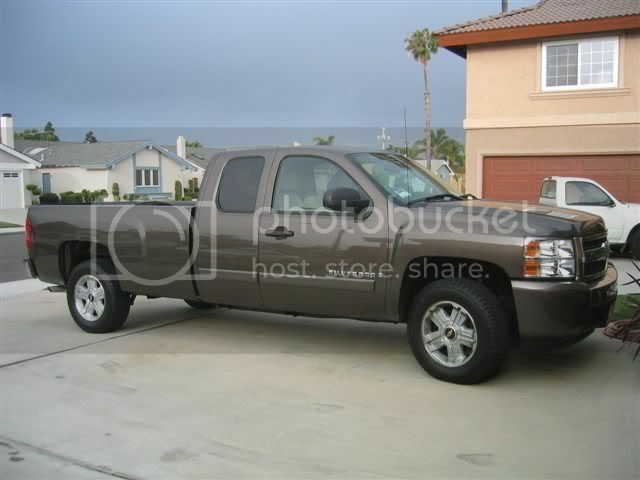 Z-71, half ton, 4 door strech cab, long bed with a few bells and whistles. Re: Have a new tool. Does it have the Duramax? With Palm trees in the background. Dang! Some people have it made. LOL yes LeRoy, your old one must have been getting awful wornout! How come that one looks the same? nice new toy..errr, tool, LeRoy. Please send me the old one. Very nice LeRoy. I'm very happy with our Chevy pickup and I'm sure you will be too. oh, nice truck I still think I'd perfer a 73-76 chevy over any of the new trucks, I just couldnt see taking somthing new offroad and not have a bumper ripped off or somthing like that I'm sure it rides nice though. Very nice truck LeRoy. I love my 01 C1500 Silverado it has served me well with absolutely no breakdowns and has over 173,000 miles on it, 3100 last week alone. The next one will be a Chevrolet too. LOL...Cuz Andy, it is is the same. The old truck is setting out front with a "For Sale" sign in the window. It has 109,000 miles on it and never missed a lick, and that's the reason I got the same thing again. It's a self treat and old guys get that once in a while. Sweet ride ! That truck does look good. Very nice looking truck. Congratulations! Only one problem that I see. Remember... It's always better to have a tool then to be "A TOOL"
Similar Threads for: Have a new tool.